When a publisher’s blurb claims that a book is “Certain to send shockwaves throughout America” I reach for my dictionary of clichés, writes Peter Mullen. 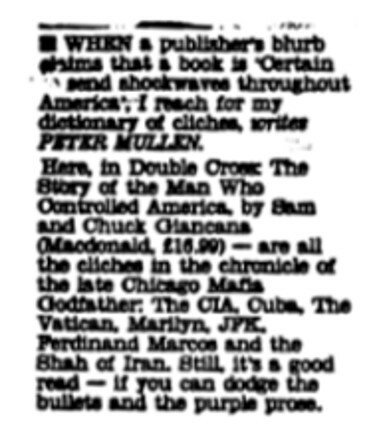 Here, in Double Cross: The Story of the Man Who Controlled America, by Sam and Chuck Giancana (Macdonald) – are all the clichés in the chronicle of the late Chicago Mafia Godfather: The CIA, Cuba, The Vatican, Marilyn, JFK, Ferdinand Marcos and the Shah of Iran. Still, it’s a good read – if you can doge the bullets and the purple prose.